Larry is touring solo as a part of the American Guitar Masters Concert Series. Larry wins "Best Instrumental" for 5th Annual International Acoustic Music Awards! Larry's original piece "Eleven Doors" from the new album "What Tomorrow Brings" wins the "Best Instrumental" category for the 2008 - 5th Annual International Acoustic Music Awards! "Eleven Doors" - 5th Annual IAMA "Best Instrumental" award! 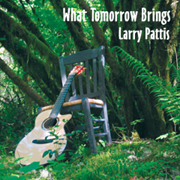 Reviews are starting to come in for "What Tomorrow Brings"
Larry to be featured at the 2009 Healdsburg Guitar Festival ! Larry will be featured with both a Workshop and Concert. Artistry of the Guitar with Ken Bonfield, Peter Janson & Larry Pattis! Workshop (also on Friday, 12:30 PM): Workshop sign-up & info here! June - 2008: Larry had a standing-room only crowd for his Guitarissimo Series concert at the Tente SIMM GM. Rain and wind nearly swept the tent away during the last 10-15 minutes of the performance, but it was an exceptional event, and thoroughly enjoyed by all in attendance. Two standing ovations and an encore performance!